Are that actual ID3 tags or just Nepomuk tags created by some application with no relation to what ID3 says? One word: AMAZING! 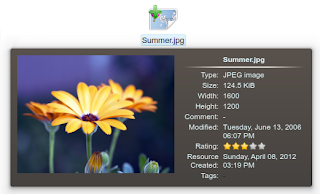 :) Thank you so much for this outstanding file manager. It is the heart of KDE. 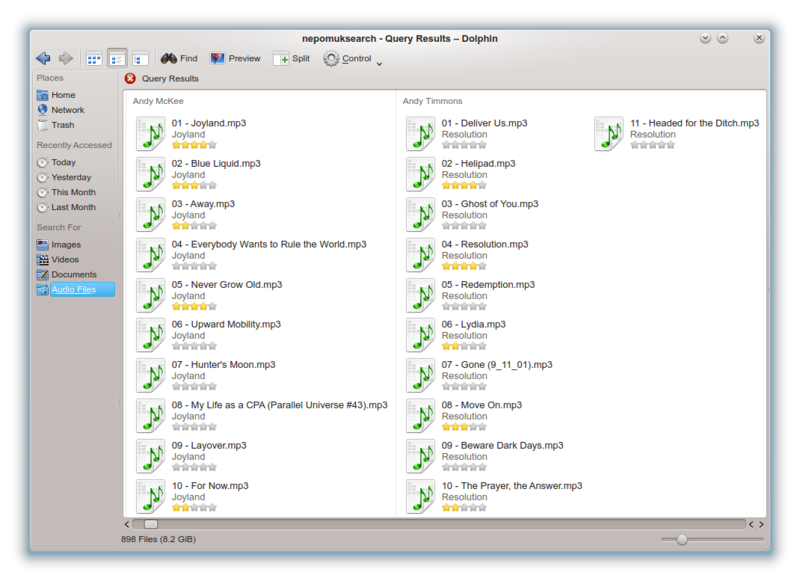 That are ID3 tags read by the file-indexer and accessed by Nepomuk. Please just create a wish at bugs.kde.org. Using the blog for feedback is fine, but it is impossible to keep track of concrete wishes here. Thanks! Shouldn't the stars be under the resolution in the foto view the same way as it's with the audio? Wow, just wow. I wonder how much time it took you to implement this feature? AFAIU this requires a change to the model to export the data and some framework to enable certain columns depending on the type of the data displayed, right? May I ask you about your background? To me, it looks like you are a real software engineer with a lot of experience in software design, aren't you? Being able to pull off an application this large on your own with such a complex architecture requires a lot of skill and expertise. Awesome, awesome, awesome! :) I've been waiting for this so long, as this will make tags, ratings and comments finally useful. Seeing only one file at a time in the sidebar or tooltip is next to useless, at least for me. So thank you for the great work! I agree with Diederik and Redm: This really brings the advantages of Nepomuk to the surface. Previously, Nepomuk was more of a "geeky" thing where users had to enter complex queries or do other technical things to make use of it. Now it's in plain sight (unless you hide these amazing views somewhere only those people who know where to look can find them ;) ). These steps are vital for convincing the average user that Nepomuk is not only consuming resources with no obvious benefit. Just awesome...I like it a lot. Thank you so much for your work!!!! Inline Nepomuk data. This is absolutely awesome. And I tried to do it immediately, but the issue is that you can't really use it with the data below the icon. It's better to have it on the side like in screenshot #4. However, I've been looking everywhere and I can't find the option to have text on the side of the icon. I was pretty sure it was in Settings > Visualisation > Icons. Has it moved somewhere else ? This looks fantastic. As others have said, it's a fabulous, practical and visible benefit to Nepomuk. Now, as soon as there's a way to avoid having all my tags, comments and ratings wiped when moving computers / reinstalling my system, I'll actually start to use all this stuff. Looking forward to it. It's looking very nice. Anyway, since the tooltips look cool now - only with blur enabled - it might be worth the consideration to turn tooltips on by default? But only if the effects are enabled and blur is available. Also, tooltips are much more stable ever since you moved them in their own progress so enabling them won't hurt the user anymore like it used to. As for the metadata shots, that looks very nice! Nice job! This looks great, Dolphin gets improves so much with every release! One small suggestion: make the categories in the sidebar (Places, Recently Accessed, etc.) bold. It would help them stand out from the other entries better. Thank you very much, I'm waiting for this feature. This is pretty cool, thanks! 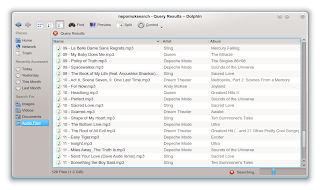 Apologies in advanced if this has been answered already somewhere else, but can you explain what happened to the Dolphin animations that appeared as part of KDE SC 4.8.0 and were then lost after the update to 4.8.1? Why did they disappeared and never come back? @all: Thanks for the nice feedback! That is configurable by the user. > May I ask you about your background? Adding this feature did not take that much time, but implementing the base for it (= the new view-engine) took roughly about 6 man weeks I'd say. As I'm doing this only in my spare-time the 6 weeks expanded to several months. I guess my background is similar to most other KDE developers: I'm software engineer and earn my money with developing non-KDE software. > side of the icon. Just switch to the compact view (View -> View Mode -> Compact). > tooltips on by default? Although I love your patch with the blurred background for tooltips I still like to keep tooltips off per default in Dolphin. 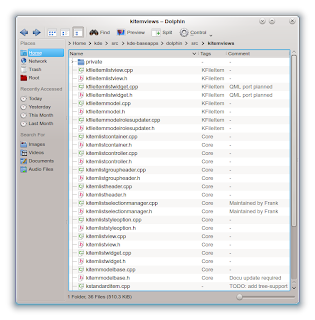 I guess the majority of the target group of Dolphin users (http://dolphin.kde.org/philosophy.html ) does not care about such details. > the sidebar (Places, Recently Accessed, etc.) bold. > It would help them stand out from the other entries better. > they disappeared and never come back? The feedback about the animations has been very mixed and I decided to turn them off for a lot of usecases. Animations are still there (e.g. just create a new item and you'll see that the moving etc. is animated) but the animations I guess you are talking about (= moving-animations when adjusting the window size) only worked fine if the number of items are quite small (e.g. 3 x 5 or something like this). 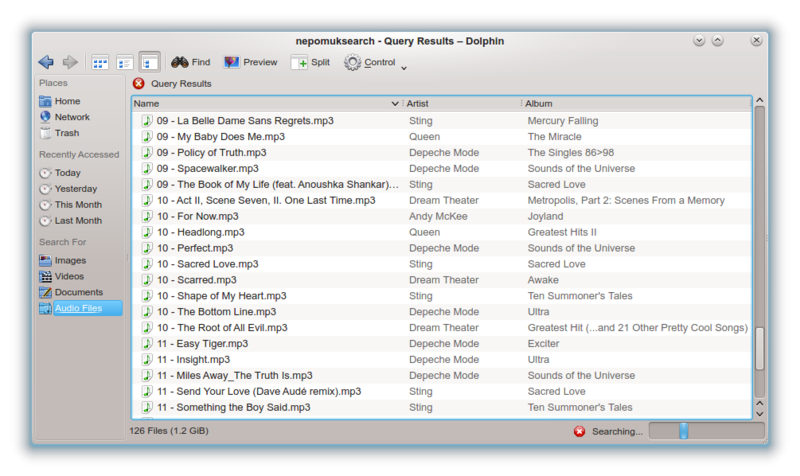 Well, what is important is that we at last can sort our files as we have been doing in other desktops/OS for lustrums. Thanks for your work, even if the lack of qualified developers sometimes stops the progress. 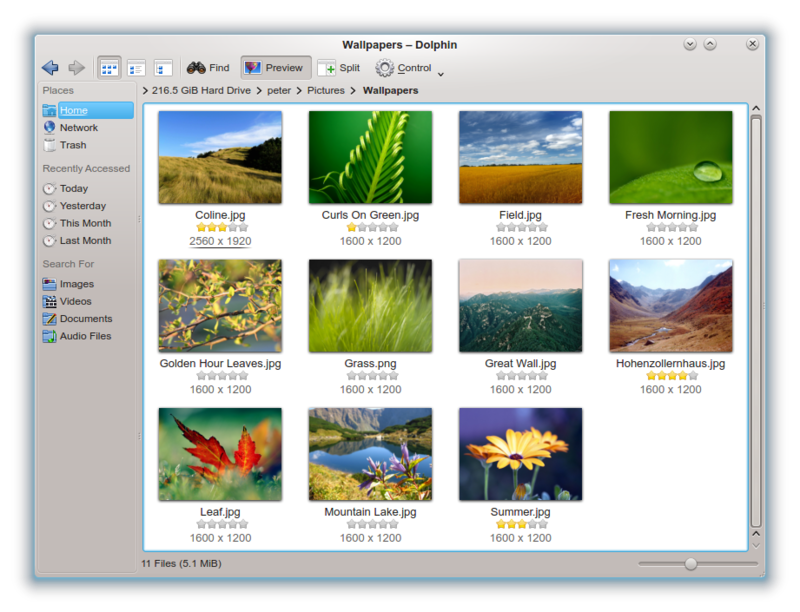 This is the one and only piece of KDE 3.5x functionality that I've still been missing in KDE4 for all this time, so it's really nice to see it coming back! 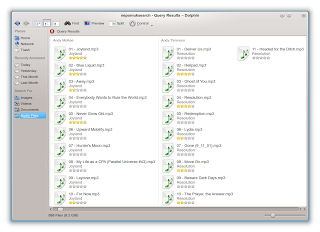 Nepomuk still seems to be missing a lot of the metadata that I personally keep wanting to see though ("duration" on audio files, quality setting/bitrate/channels on Ogg Vorbis files, metadata for webm files, jpeg comments, Vorbiscomments, etc.) but at least it's in progress now. I love Dolphin and I want to say thank you!!! But I want to tell you about a one bug. 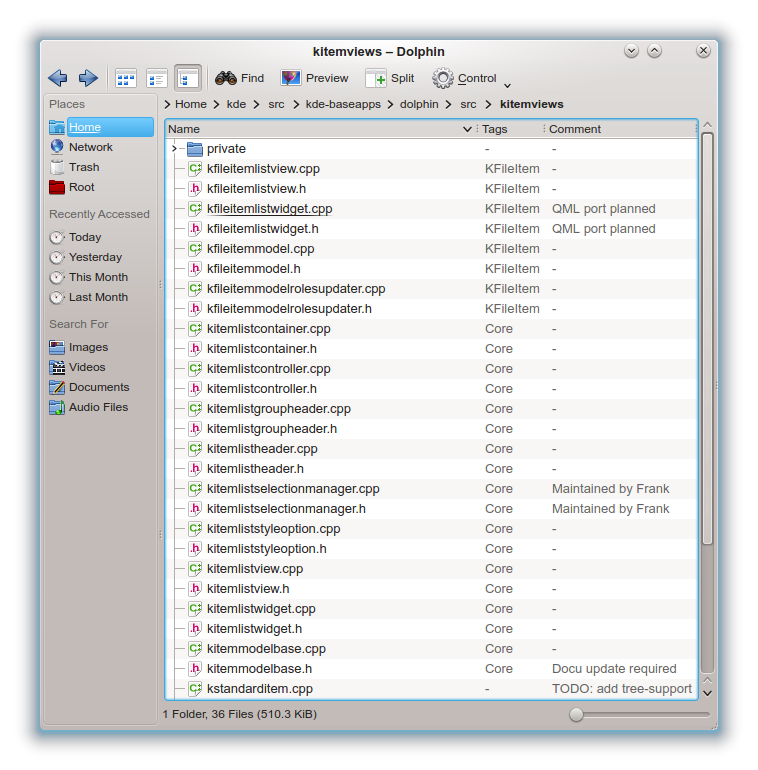 When I change size of icons in folder in which the "preview" function is disabled, Dolphin changes size of icons in every folder with "preview" disabled. There's similar problem with folders, where "preview" function is switched on. > to say thank you!!! > every folder with "preview"
That's the intended behavior and works this way since 5 years. In general please just use bugs.kde.org for submitting bugs - it is impossible for us developers to keep an overview about bugs that are reported in blogs ;-) Thanks.